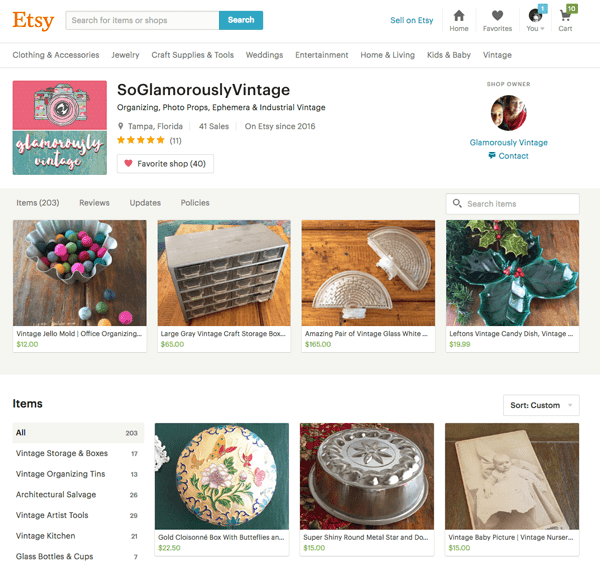 Today we are going to be talking about selling vintage products on Etsy. This is WAY different than selling handmade items and comes with its own challenges and rewards. So the biggest challenge for me about selling vintage items is that there is very little opportunity to sell similar items. Yes, you might find something that works consistently for you (like I sell a fair amount of baking pans) but in the grand scope of things, you are going to be finding unique items that are not necessarily going to keep consistent links going in your store. This makes doing Pinterest and the like harder. You get a great pin going and then, BAM, someone buys that item and you don’t have another one to follow up with. Another huge challenge for me is finding great information to get help. There are A LOT of people who are there to help handmade sellers, but not so many to help vintage sellers. In fact, most of the information that I have found about selling vintage is for Ebay sellers. I can get an idea, but really want to drill down hard about Etsy for vintage! While there are challenges, the rewards far outweigh them for me! I am not the kind of business woman who would be able to do crafts over an over again. While I admire the gals and guys who can make 1,000 of the same thing, I would definitely get bored quickly. I love the fact that each of the things that I sell is a little marketing opportunity unto itself. I also like the uniqueness and variety of the things that I can list. Oh, and digging around in nasty old garages… well that is super fun for me! The last reward is keeping great items out of the landfills. I feel like I am rescuing treasures and then finding them a great home with someone who will love them like I do! My home is always filled with “old junk” and whenever someone comes over they are amazed at how warm and homey it is. I feel like old things are made better and deserve to have a place in the world. 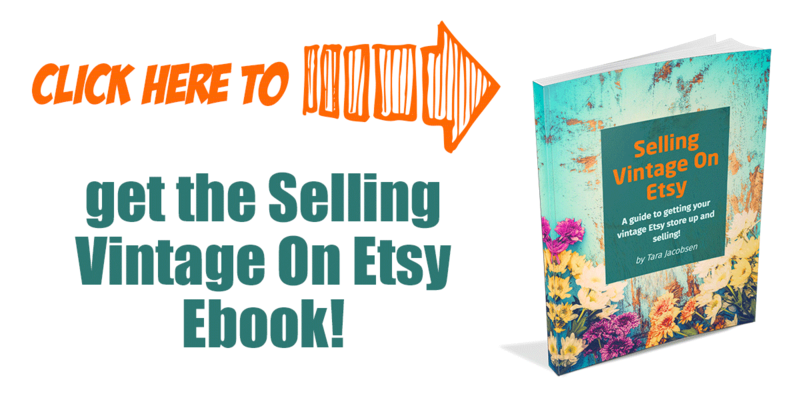 Now that we have gone over the whys, let’s dive into the hows of selling vintage on Etsy! This part is going to be an overview of how to start or get a focus for your store. You need to have some kind of cohesion to your store and offerings or it will just be a jumbled mess that no one will ever buy from. Instead try to make sure that your offerings are somewhat similar (or at least that the same kind of buyer type will like them all). I am not sure that you have to have just one niche though. 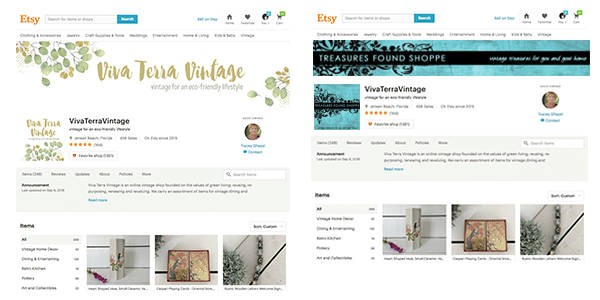 When you are buying vintage it would be great to think that you could source enough old stuff to get 172 listings exactly similar items in your store right off the bat (I got this number figuring out how many items you should have in your Etsy store). But I tend to think of the number of categories as a guide for how many different kinds of things I can list. There are 15 categories so I have to buy things that fit into one of the categories that I already chose! This gives me a nice overview of things that I can sell. My last 5 sales have come from Vintage Kitchen, Vintage Home Decor, Vintage Home Decor, Vintage Storage and Boxes, Vintage Kitchen. So if I had to pick just three areas to focus on I could drill down and just source things in those categories. Should you pick things you like or things that sell? One big question that comes up a lot with me and one of my Ebay besties is whether you should buy things that you “love” or things “that will sell”. When you are choosing a niche for your store I think that this is super important. I tend to pick things that I love. I know that I will be more likely to list them if I think they are cool. I take better pictures and like boxing them up to ship. Tena, on the other hand, sells anything that will make money. She sells trucker hats and Mary Kay and old blank tapes. That is not my idea of fun, but her idea of fun is to make lots of money not to care about what she is selling. 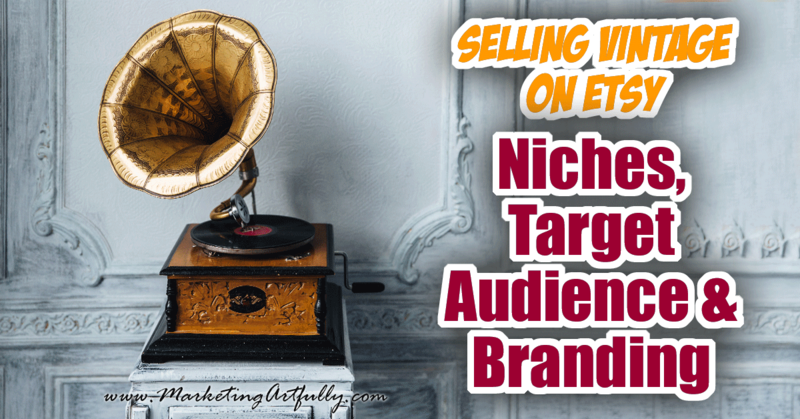 Once you have your niches, you want to figure out your target audience. This is where the “sell anything” falls apart in my opinion. 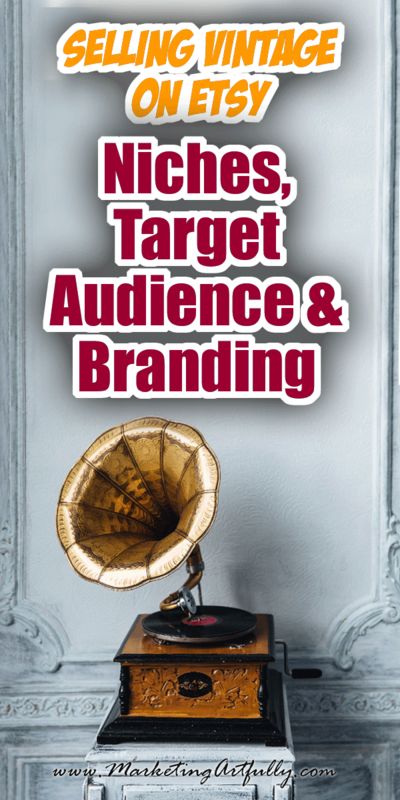 If you have a mix of items that are more similar, you can start to think about who your target audience is! Hipsters – Impress your friends with these cool rocks glasses from the glory days of drinking! Rockabilly – Imagine these sitting on your bar at home, how snazzy and cool they will make your drinks look! High End – Impress your friends with these classic and timeless pieces of barware. They are made incredibly well and harken back to a time when the “cocktail hour” was a time to get together with friends. Titles and tags are great to sell your items, but descriptions will help someone decide that they have to have your item! Each piece you sell will have a someone or a couple of people you think might be the perfect buyer. 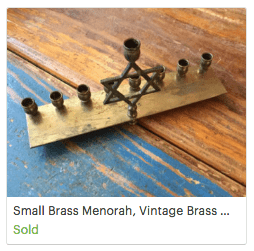 With this small brass menorah, I thought about who would want a little piece like this. Then I was like, a mom would want to give this to her son or daughter to have in their dorm room or small apartment. Moms don’t mind spending money on their kids. Or it could be someone who wanted to have it on their desk and not take up too much room. As you are listings something and writing a description, think about WHO would want to buy the piece you have in front of you AND who generally would be interested in the kinds of items you have listed in your store. ETSY BUYERS ARE COOL – Just as an aside, I want to talk about the people who shop on Etsy. They are not looking for “normal, mass produced” items. If they were they would be on the Walmart site or even West Elm or Overstock. Instead they have chosen to shop on Etsy where there are hand made and vintage items. They care about your store and how you present your items because they are not just buying “something”, they are buying the experience of getting something unique. One last word about niches and target markets…there is one other way a mishmash of things can hurt your store. Say you have vintage tshirts, old thimbles and antique guns for example, your target market will be all over the place. You will be selling to hipsters (tshirts), older women (thimbles) and men (antique guns). That is a pretty broad range to try to appeal to. Now, it can work, but it would be much easier if you tried to source things that have some kind of common ground. When you are branding your vintage store you want to make sure you are considering your target audience and how the way your store looks will appeal to the people you are trying to attract. My store is branded to be cool and hip and funky. My pictures are never just a clean snapshot on a white background, instead they are styled to be cute or fun or interesting. I KNOW that when you are selling products that you “should” have your product on a white background, but that is just not how I choose to do things! I have other things that match my shop including business cards that I send out with every purchase and stickers that I use in my packaging. Now, please do not think that you need this kind of branding to open your shop. I am a graphic artist so doing this was relatively easy for me. You can pick a color or a pattern or something else that will let people know that they are in the right place when they find your shop. The key is to making sure your stuff looks like your stuff! Header Note: I have chosen not to use the giant header across the top. I want people to focus on my products not my branding but that is a personal decision. There is a value to having a big branding bar that people can see when they come to your store, I just don’t want that for mine. PLEASE do not get so hung up on your branding that you get “stuck”. I have seen business owners spend MONTHS trying to get their branding right, time they could be sourcing or selling or doing ANYTHING more effective than obsessing about the look for their shop. Do not forget, you can always change your branding! 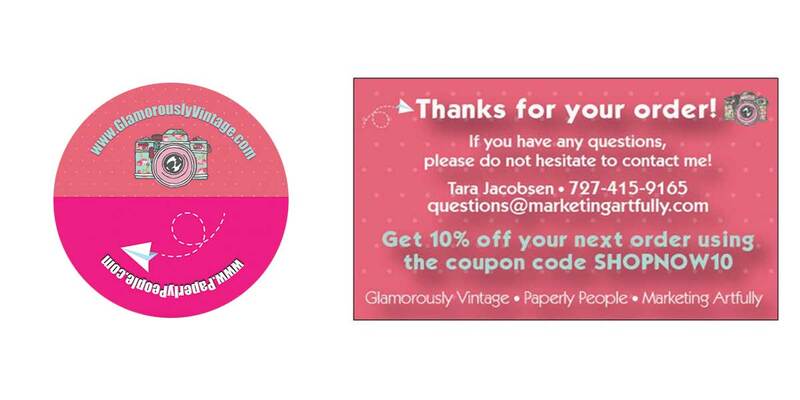 One of the gals in our Facebook group just switched her branding from the dark blue to light and breezy. Now, I don’t think her old branding was heinous, but I do think that the new branding is more professional and appealing. BUT make sure you look at the number of sales Tracey has. She is rocking 456 sales BEFORE she went back into the look of her shop. Is it important to have nice looking shop branding? Sure. But I have seen shops with hideous branding or no branding that have scads of sales. Get funny about your branding when you have gotten your sales and sourcing down pat!